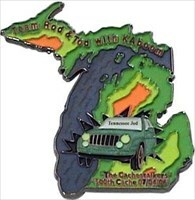 (TB1AA2T) Rockin Roddy's Cachestalkers Geocoin - Todie's Wild Ride: Stop driving distracted, look for bikes! Todie's Wild Ride: Stop driving distracted, look for bikes! In the hands of XNachteuleX. Use TB1AA2T to reference this item. To raise awareness of bikers, both motorcycles and bicycles who share the road. Please help the coin move as often as possible, to spread this message. If the coin gets the chance, it should head towards Norway, Oslo, GC2JX1E. This coin was released in the loving memory of Tod Phillips, a geocacher and great guy who lost his life in a bike accident. It is also dedicated to all who lost their lives on the roads. Please, keep your eyes on the road, expect the unexpected, and always be careful! The coin was adopted from Gatoulis to mamoreb in May, 2011. Gallery Images related to Todie's Wild Ride: Stop driving distracted, look for bikes! Auf dem Rückweg von Berlin haben Chevalina und ich diesen TB im TB Hotel Bahnhofsiedlung - GC7ZP7B - Berlin entdeckt und mit auf eine Reise genommen.